The first definitive history of the long and distinguished history of one of the country’s top Catholic hospitals was launched by Archbishop Diarmuid Martin last week. ‘Caring for the Nation’ looks at the 150 year story of Dublin’s Mater Hospital from its beginnings helping the poor in the city during the 19th century, when only the wealthy could afford to gain access to medical care, through the years of the Civil War and the Emergency. In his address, the Archbishop paid tribute to the foundational vision of the foundress of the Mercy Sisters, Venerable Catherine McAuley, who started the order in 1831 in order to care for the sick and poor. The hospital was opened by Archbishop Daniel Murray of Dublin on 24 September 1861. “It is the history of exceptional people with a capacity for exceptional care,” Archbishop Martin said and he noted that the book is also a history of the people of Dublin from the 1860s onwards. He said it was a history marked to a great extent by poverty, poor healthcare, epidemics and poor living conditions. Referring to Mother Catherine McAuley as “an exceptional figure who dedicated herself to healthcare and care for the poor”, the Archbishop recalled that her policy was that the poor deserve the best just as much as those who can provide from their own needs. “Healthcare cannot be selective or preferential – it must reach out to every human being,” the Archbishop said. He described the history of the Mater Hospital as a history of two realities: the history of the changing face of poverty across generations of Dublin people and the evolution of medical excellence which the hospital had strived to provide and medical science had developed. “This is a voluntary hospital and a Catholic hospital. Its volunteerism is marked by the participation of citizens in its management. Its Catholicism is just not something denominational or divisive but the fruit of an added quality which is brought to its services by Sisters, lay men and women,” Archbishop Martin said. He warned that the progress of science must not lead the hospital to lose its vocation to the service of the broader community. “Your written statement expresses the challenge of combining compassion and professionalism – professionalism is not the opposite pole to compassion. They belong together,” he said. He also paid tribute to the research compiled for the book by Sr Eugene Nolan, RSM, who is the hospital’s archivist and who also nursed there for many years. There is a sense in which the Catholic care of Catherine McAuley could not but be transformed into Catholic medical excellence, the Archbishop told members of the hospital’s staff gathered for the launch. 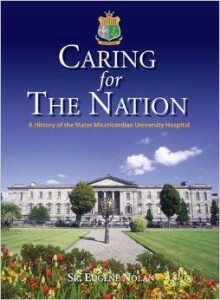 ‘Caring for the Nation’ tells the story of the Mater Hospital. It outlines the rapid medical developments that took place during and after World War II including the development of antibiotics, which meant that diseases such as TB, which had traumatised the country, could at last be cured; the growth of x-ray as a diagnostic tool, and the rapid progress in cardiac care, including the country’s first heart transplant, carried out by Maurice Neligan and Freddie Wood in September 1985. Founded by the Sisters of Mercy in 1861, the Mater was the first hospital to open its doors 24 hours a day, and the only refuge open at the time to those affected by the smallpox and cholera epidemics that raged through the overcrowded tenements. It was the first hospital to care for outpatients, and was at the scene of many of the most dramatic and traumatic incidents to grip the city, such as the attempted rescue of Sean MacStiofain from the hospital while on hunger strike, the Dublin bombings of 1972/73, and the Stardust tragedy in 1981. Likewise, when some of the doctors were putting cholera patients, who were close to death, into coffins Sr Berchmans said she would sit with anybody who was dying and make sure that they were dead before they were placed in a coffin. She expressed the hope that those who read the book would get a fresh insight into the contribution of the Mercy Sisters to medical healthcare in Irish society.